One of the key functions in the DETEXI NVR is recording video. The most processing resources are required by recording. To address this, image and video compression techniques can be utilized to reduce the bit rate. The goal is to reduce the amount of data as much as possible but, at the same time, have as little an impact on the image and video quality as possible. The current version (5.5) of the DETEXI NVR streams and records network video in Motion JPEG format. Motion JPEG is a digital video sequence that is made up of a series of individual JPEG images. One of the advantages of Motion JPEG is that each image in a video sequence can have the same guaranteed quality that is determined by the compression level chosen for the network camera or video encoder. Since there is no dependency between the frames in Motion JPEG, a Motion JPEG video is robust, meaning that if one frame is dropped during transmission, the rest of the video will not be affected. The main disadvantage of Motion JPEG is that it makes no use of any video compression techniques to reduce the data since it is a series of still, complete images. The result is that it has a relatively high bit rate or low compression ratio for the delivered quality. For this reason, configurable Encoder is available in the DETEXI NVR. When enabled, compression in the NVR involves finding the difference between two images in the video stream and then applying a compression algorithm. By adjusting the Encoder settings, users can balance the recording file sizes and the video quality necessary for their system and network cameras/video encoders. Since the NVR encoding surely put an extra burden on the NVR’s processor it is used only in rare situations. Today’s PC is able to run a video management software, and record and store video from numerous cameras. If the hard disk on the actual server running the NVR is not enough, there are solutions (such as network-attached storage — NAS) that enable you to increase storage space. For optimized quality and bandwidth MPEG-4 and highly efficient H.264 video compression will also be supported in upcoming DETEXI NVR 5.6 release. MPEG-4 supports low-bandwidth applications and applications that require high quality images, no limitations in frame rate and with virtually unlimited bandwidth. H.264 is the latest MPEG standard for video encoding. H.264 is expected to become the video standard of choice in the coming years. This is because an H.264 encoder can, without compromising image quality, reduce the size of a digital video file by more than 80% compared with the Motion JPEG format and as much as 50% more than with the MPEG-4 standard. This means that much less network bandwidth and storage space are required for a video file. Or seen another way, much higher video quality can be achieved for a given bit rate. Configurable Encoder is available in the DETEXI NVR. When enabled, compression in the NVR involves finding the difference between two images in the video stream and then applying a compression algorithm. By adjusting the Encoder settings, users can balance the recording file sizes and the video quality necessary for their system and cameras. 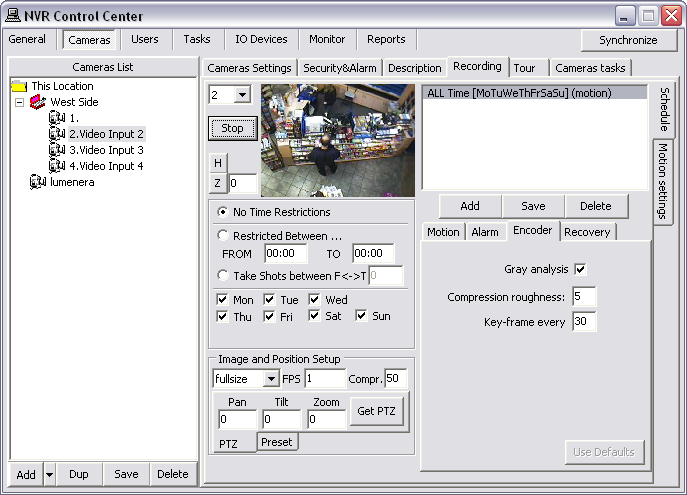 Setting up encoder settings for many cameras with complicated recording schedules could be time consuming. To make it easier a template enforcing particular settings in a newly created schedule can also be setup allowing the default settings to be adjusted later in any recording schedule. Under the Recorder Encoder Settings setup a Compression Level (0-9). Level 0 disables all compression capabilities, meaning all video will be saved in raw, uncompressed form (default); compression settings in recording schedules will be disabled. Level 9 defines the highest available compression level, and is very resource intensive. Under the Template check Gray analysis checkbox to enable gray analysis. When enabled, images are converted to gray-scale before comparing; minimizing the effect of color changes. This setting is highly recommended for outdoor environments. Enter a Compression roughness (1-7) — the level of changes between two frames considered important. Define Key-frame every — how often an uncompressed (key) frame is saved. There should be at least one key-frame per minute of video. If recording on Motion Only/on Alarm is setup in a recording schedule the compression settings will be ignored to protect alarm video quality. In the NVR Control Center — Cameras select camera to configure from the Cameras List and switch to the Recording. Select a recording schedule and switch to the Encoder tab. Adjust encoder settings — the Use Defaults button will be enabled indicating that the encoder settings differ from those defined in the template. Click the button to return default settings. Click Save button below the schedules list to save the updated recording schedule. Compression Level 0 in the NVR Control Center — General — Advanced disables all compression capabilities, meaning all video will be saved in raw, uncompressed form; compression settings in the recording schedules will be disabled.